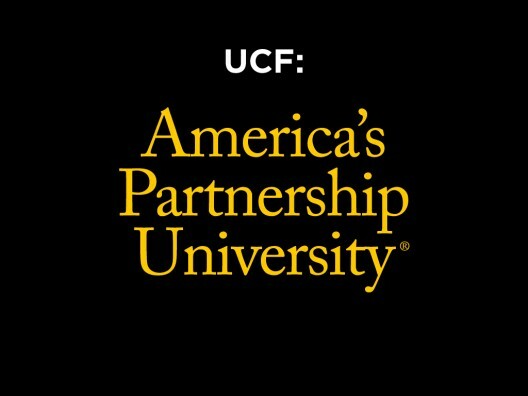 "America's Partnership University" and "America's Leading Partnership University" are new trademarked slogans for UCF. The University of Central Florida is one of the nation’s 16 leading universities when it comes to innovation and economic prosperity, according to the Association of Public and Land-grant Universities. UCF, which joins The Ohio State University and the universities of Michigan, Georgia and Minnesota on the inaugural list, was recognized for offering several programs that stimulate economic growth in Central Florida and aggressively pursuing partnerships that benefit the region. The university also was lauded for recruiting top students and faculty members in fields are vital to the region’s economy, promoting a campus culture that can adapt quickly to meet regional needs, and for effective leadership. The university’s Business Incubation Program, which recently graduated its 100th company, was named Incubator Network of the Year in 2013 by the National Business Incubation Association. GrowFL, administered by UCF’s Economic Gardening Institute, has helped more than 400 Florida companies grow at a rate three times faster than their peers, adding more than 4,100 direct and indirect jobs. The Blackstone LaunchPad opened last month to empower UCF students who have ideas for businesses with the knowledge and skills they need to succeed. The LaunchPad, based in the Student Union, provides one-on-one coaching, seminars and access to a network of mentors and experts who can help students start successful businesses. The Florida High Tech Corridor Council, conceived by President Hitt in 1996 as a partnership with the University of South Florida, University of Florida and economic development organizations, has created an estimated 4,000 jobs and served more than 375 companies. The Council also has provided hands-on research experience for 2,500 students. UCF also offers several academic programs focused on industries vital to Central Florida’s economy. Those include the College of Medicine, Florida Interactive Entertainment Academy, College of Optics and Photonics, Institute for Simulation and Training and College of Engineering and Computer Science. The multi-year process initiated by the APLU helped institutions better assess their engagement in economic development activities and better demonstrate the positive impact of such activities. Applicants also identified areas for growth and improvement for their university’s economic engagement enterprise. This process included representatives from local governments, companies and economic development agencies. APLU is a research, policy, and advocacy organization representing 219 public research universities, land-grant institutions, state university systems, and related organizations. Founded in 1887, APLU is the nation’s oldest higher education association with member institutions in all 50 states, the District of Columbia, and four U.S. territories.